ice skating | bahá'í children's class ideas! 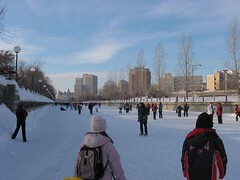 Several members of our teaching team just spent part of the afternoon on the ice at Ottawa’s Dow’s Lake, where many people, both locals and visitors from far and near, spend the winter months skating around on the world’s longest skating rink. no skates for us, though—we were accompanying two families from our Chinatown children’s classes who had never been out on the ice before. boots for all, and at least one young child snoozing comfortably in a stroller. the kids were full of energy, and dashed up and down the frozen surface of the lake at least twice, hooting and hollering, falling over and getting back up again, bumping into each other and flourishing into big hold-on-for-dear-life hugs. despite the chaos of little feet scrambling around on the ice, we managed to reinforce some of the lessons from the children’s class, such as showing kindness by helping our siblings and friends up when they fall. one of the children, a six-year-old girl, was asking lots of questions about all the big buildings she saw around us, which i attempted to answer, explaining the long words in their names. Perhaps thinking of other big complicated words, she asked me, “What about that ‘Thou art’… you know?” “You mean, ‘Thou art the Mighty and the Powerful’?” I replied, citing the prayer we had been memorizing together. “Yeah, that one. How does it go again?” she advanced. I repeated the prayer for her (making sure to be reverent and respectful), and she repeated it afterwards. We talked about what “mighty” and “powerful” meant, and discussed what it means that God is Almighty and All-powerful. Really nice. I felt like it was a great bonding experience between us and the families; sort of like friends getting to know each other better. We walked them home feeling lots of joy at being together, knowing that we would meet again soon for another class. This entry was posted in experience and tagged family, parents, social by dan. Bookmark the permalink.